Multi-stage biological and mechanical filtration process provides maximum pond filtration. 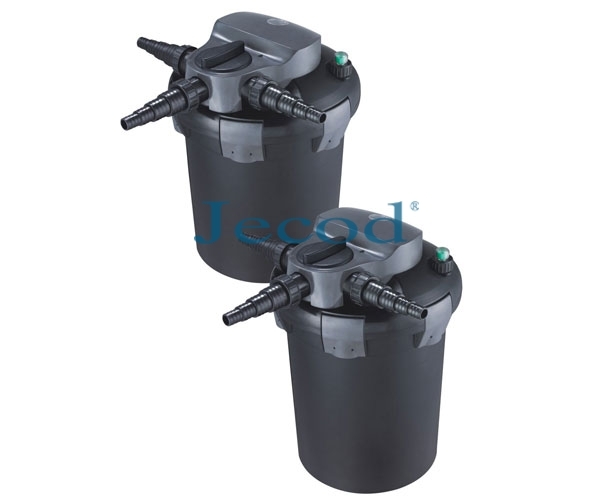 Unit Is designed to be hidden and keep your pond environment beautiful--Jecod bio-filter is meant to be partially burled! UV light incorporates special quartz glass,a high-quality clear material that allows virtually all ultra-violet light to pass, significantly increasing the performance of your filter. Water Is pumped into the filter creating the necessary pressure to begin the mechanical filtration stage. There are two phases In the mechanical filtration stage-coarse and fine filtration. Each phase uses a specially designed foam sponge to effectively remove all sizes of unwanted debris. STAGE 2-BIOLOGICA上FILTRATION The biological filtration stage begins when water reaches the bottom of the filter. This stage uses bio-balls providing a habitat for beneficial bacteria to grow. These bacteria naturally convert harmful ammonia and other wastes into healthy nitrates that fertilize aquatic plants and support a healthy pond environment. STAGE 3-UV FILTRATION The finial filtering stage uses a Ultra-Violet (UV) light located In the middle of your filter. Exposure to the IN light kills algae as the water passes upward through the filter on its way back to your pond.